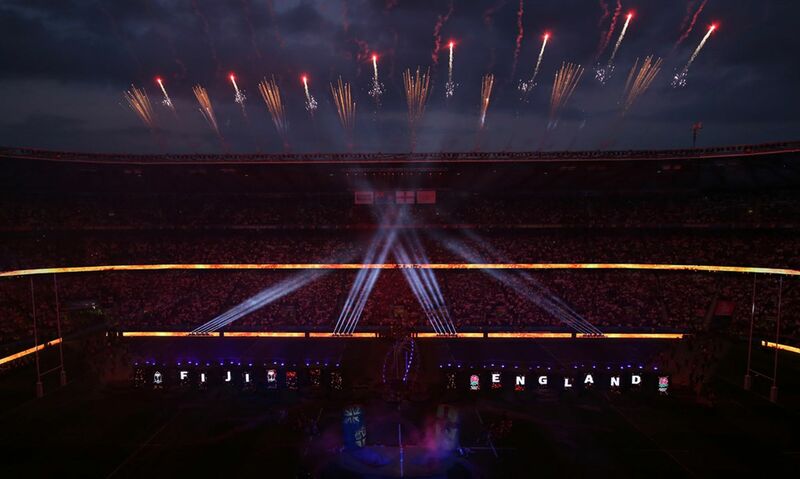 Titanium Fireworks were delighted to work with Progress Productions to deliver the sports presentation for the England 2015 Rugby World Cup. With a comprehensive procurement process consisting of proposals and interviews, we were contracted in March to deliver the sports presentation for the opening game and all of the knock out games including the third place play off and of course the final. 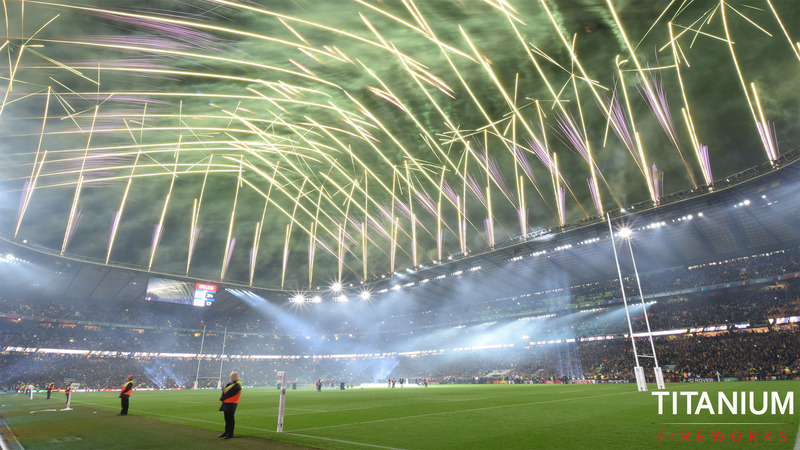 The scope of works included pitch pyro, flames and pyrotechnics fired from the roof of the stadium to enhance the team entrance, the final also included pyro moments for the anthems, trophy presentation as well as a 90 second finale sequence synchronised to a soundtrack fired form the roof of Twickenham Stadium brining the tournament to a spectacular close. We worked together with Event FX who specialised in the flame and pitch pyro while Titanium Fireworks delivered the roof pyrotechnic, where the team had built a reputation for similar events including the London 2012 Olympics and Paralympic ceremonies as well as the Commonwealth Games at Glasgow 2014. Additionally the client required a trophy tour, the William Webb Ellis trophy would visit all 18 venues at least once and on each occasion a heightened team entrance was delivered with flames and pyro. The live audience was as important as the broadcast audience, it was imperative that the live audience felt included as their excitement feeds the atmosphere in the stadium which translates positively to the broadcast experience. 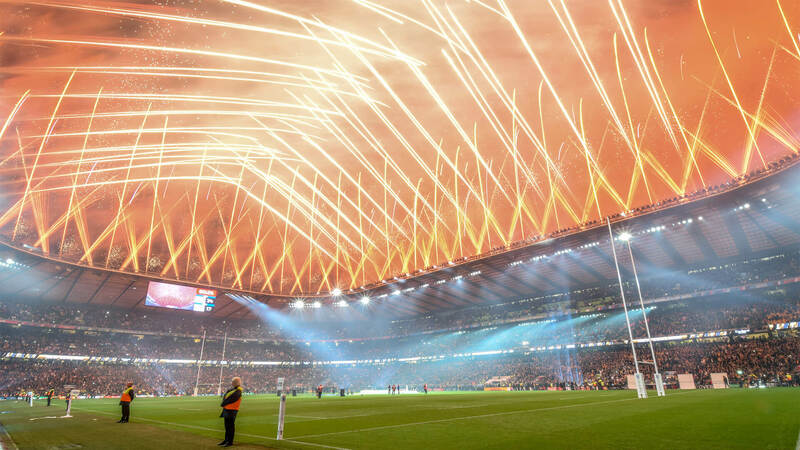 After a number of live tests at Twickenham, we developed the team entrance moments for all the games and with the soundtrack selected we designed and choreographed the final 90 second pyro sequence. With over 4000 specialist zero debris close proximity pyrotechnics fired from 86 positions around the stadium roof and over the field of play, the 90 second sequence delighted the 70,000 strong capacity crowd along with countless millions watching worldwide. We are delighted to announce that the Rugby World Cup Final has been shortlisted in the event production awards for the best visual spectacular category.